Kouign amann is a butter pastry that is rich with a caramel like crust that can be both crunchy and chewy. If you’ve been to Bretagne in France, you will know that it is famous for butter, a key ingredient in this decadent sweet. My favorite kouign amann in Tokyo is at Dominique Ansel Bakery in Omotesando. Another one that I like is this one from Maison Kayser, which has branches throughout the city, including at Shinjuku Takashimaya. For my birthday we went to Dominique Ansel Bakery’s Cafe on the second floor of his shop. The menu has always intrigued me, especially since I saw a photo of his avocado toast. New on the menu is chicken pot pie, which was the best pot pie I have ever had. A crispy golden crust over an umami-rich stew packed with chicken and vegetables. I woke up the next day thinking about this. The avocado toast comes with créme fraiche and a salad. The butternut squash was accented with cinnamon marshmallow squares. The first floor of the shop is almost always full. The cafe has a full drink menu as well, including champagne and wine. There is an open kitchen and on my way out I could see a lobster roll being assembled. We were so full from lunch that we celebrated at home with chef’s signature DKA, Dominique’s version of the kouign amann. 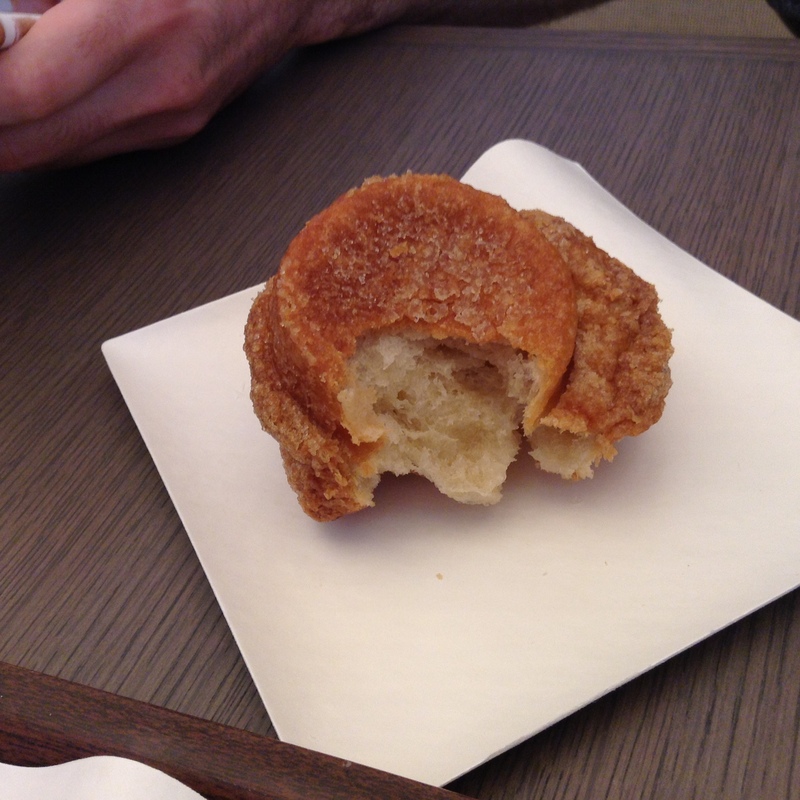 This pastry is very popular in Tokyo and many bakeries serve their version of it. This one is not too sweet, has a rich texture from the buttery dough. The shop is very popular and the line can be very long on the first floor. Reservations can be made for the cafe and sweets from the first floor can be had in the cafe, along with a drink order. The only thing that is only sold on the first floor is the cronut. 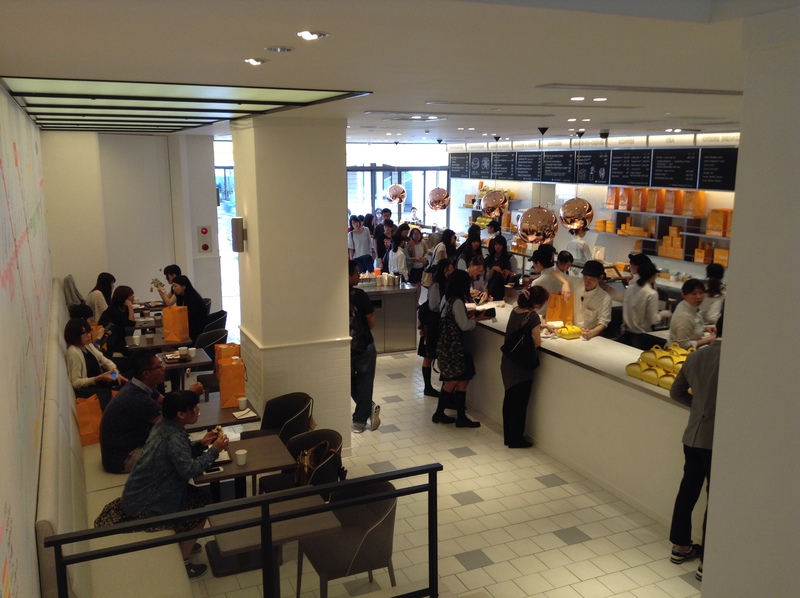 From what I hear from friends in NYC, the line here in Tokyo is much shorter for cronuts. The bakery is in Omotesando, just off the main street. It is worth the short detour if you are in the area of Harajuku, Shibuya, or Meiji Jingu Shrine. 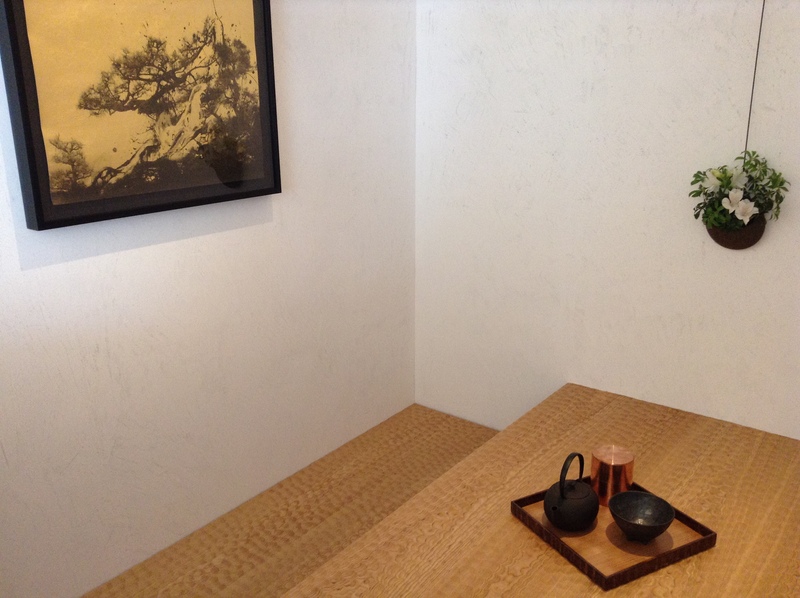 The first floor opens at 8 a.m. and the cafe opens at 9 a.m. A great spot to start your day in Tokyo. Dominique Ansel Bakery Tokyo has finally opened. The local media has been leading up to this event for several months so it is no surprise that there are long lines. The first customers started lining up about 9:30 p.m. the night before, on a wet evening during rainy season. Staff brought out umbrellas for the customers, very Japanese of them, a nod towards”omotenashi“. On the opening day the first customers in line were given DAB baseball hats. The bakery will also bring out warm madeleines to those standing in line. I went in a few days after it opened and was lucky enough to get a tour of the space and sit down with chef Dominique to talk about the opening. My take-away from speaking with him was how down-to-earth he is, how much he supports his staff, and his creativity and playfulness. He has brought together a great team, including head chef Laurie Jon Moran, executive sous chef Mitsuhiro Shimotaka, and general manager Yuji Okada. There are almost 100 on the staff. Ansel says how hard-working his team is. The Japanese adore the buttery, flakey, sweet kouign amann, so it is no surprise that the DKA is one of the more popular sweets at the bakery. However, chef Dominique’s version is rich and dense, just take a look at the photo above. It uses half the butter and half the sugar as usual and has a touch of fleur de sel. It is a nice contrast to the thinner versions which are typically found throughout the city. 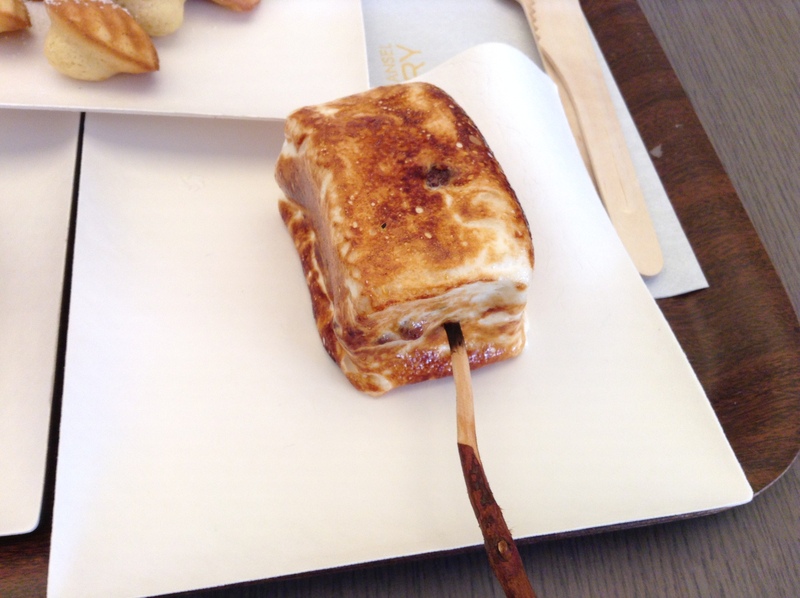 The frozen s’more is presented on a natural wooden stick that has been smoked. The marshmallow surrounds a center of vanilla ice cream, salted chocolate, and a cookie is fired just before serving. The marshmallow is made with honey instead of sugar. The madeleines are baked after each order is placed, so that they are served warm out of the oven after being freshly dusted with powdered sugar. There are some Tokyo-only creations, including the Japanese cronut which is now being made with a yuzu cream and Hokkaido milk. The Tokyo Brest, a play on the classic Paris Brest, is made with mattcha and passion fruit and is garnished with a ginkgo leaf. There is a kawaii (cute) maneki neko cat creme puff that is filled with yuzu vanilla. The traditional Japanese melon pan is made with kokuto black sugar and hojicha (roasted tea) cream. It is called Mr. Roboto melon pan as it looks like a robot’s face. Chef said that he has toned down the sugar a bit for the Japanese market. Looking at the sweets in the glass display case it is evident this is for a fun, young, casual market. At 3 p.m. the cookie shots are available. Vanilla is steeped in milk for 24 hours and the cookies come out of the oven. A good excuse to come back in the afternoon. The bakery is a three-story building. The first floor is the bakery with a seating section and a kitchen for finishing the sweets. This is where you will find the cronuts and other sweets. The second floor is a cafe with its own menu. Chef Laurie Jon Moran. There is also a quiet tea room off to the side. Chef is making a mont blanc wagashi that I need to come back for. The working space for the staff is nice, especially the third floor production kitchen which is well-lit with windows that bring in natural sunlight. Sadly, many production kitchens are hidden away in the basement or in some dark part of the restaurant without any windows. 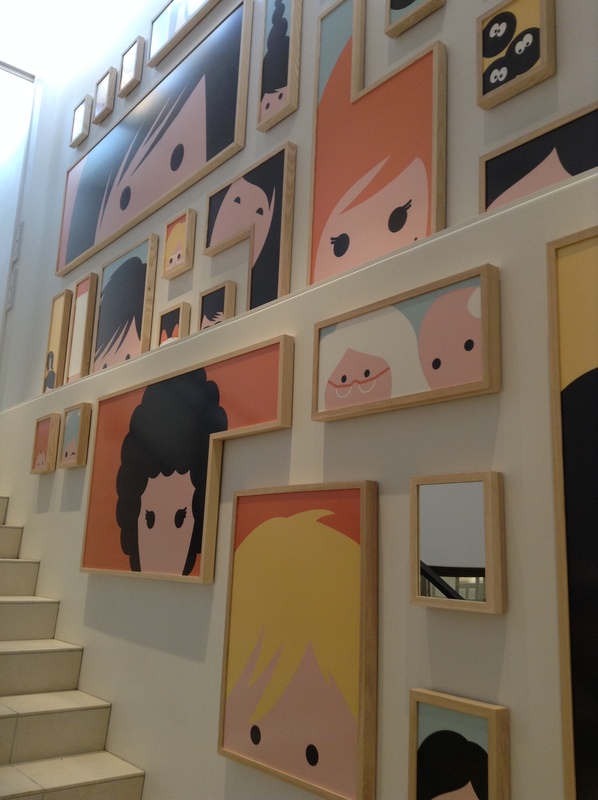 The custom-made graphics on the wall are from French graphic artist Vahram Muratyan. It is a play on the view from the kitchen of customers peering in. The wall includes some nods to Japan including a sumo wrestler and the black makkuro-kurosuke from Ghibli’s Totoro. There is a mirror on the wall so that you can imagine what you look like peering into the kitchen. Be sure to also check out the playful Metro map on the wall of the cafe. The lines for the bakery are actually on the main Omotesando street. Staff will bring the customers on the back street where the bakery is. I have seen many chefs open in Tokyo and sadly they pick the wrong location to open up on. A famous Michelin-starred chef first opened his restaurant in the suburbs of Tokyo and of course it didn’t survive. He has since successfuly reopened in the heart of the city. But DAB is in a perfect location for his first shop. Chef Dominique also spoke on the Japanese appreciation for sweets. He definitely understands the market and is off to a great start. Tokyoites are embracing him and his bakery. Here’s hoping that this is the start of a long ride for him and his team in Japan. 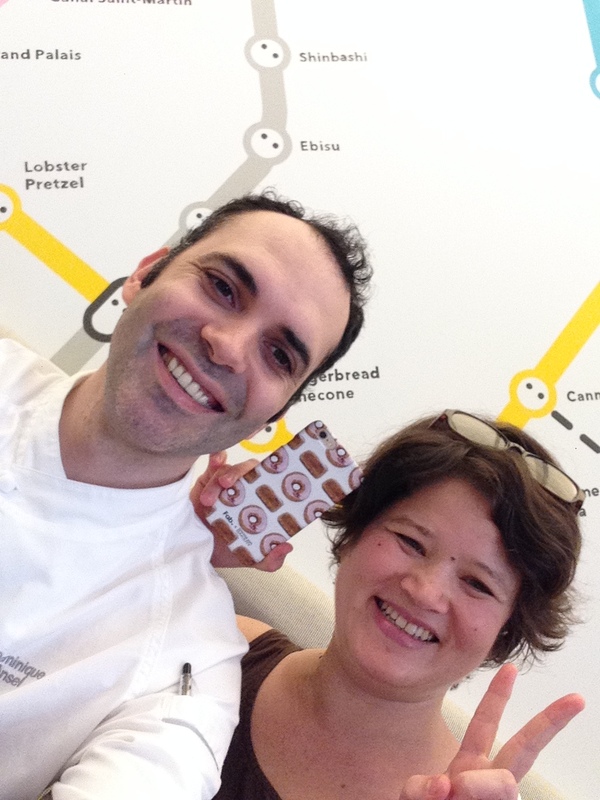 Note – if you do see chef at the bakery, ask to take an #Anselfie with him.